The Gladiator Joust is one of the most popular games for college and high school events, as well as team building events. A great addition to round out your event! 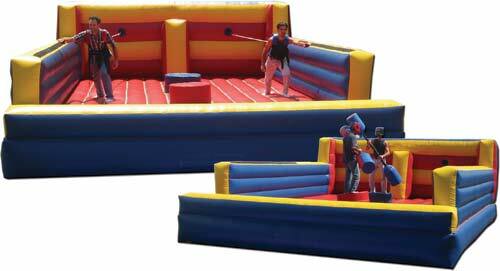 Our gladiator joust has very safe foam pedestals that are inserted into the inflatable base of the gladiator unit. Padded joust sticks and helmets are supplied to make this a fast action game. Grab the Velcro Wand and stretch yourself to the limit as you are attached to a Bungee cord, race your opponent down the double lane and see who can go the distance. Imagine running at full speed only to be pulled back with a large rubber band attached to your back! Perfect for people who always wanted to try bungee jumping but where afraid of heights. Over 30' of great challenging and exciting fun can be at your next event. Set up indoors or out. The Bungee Run goes fast so book now to reserve your rental!